Add all the items you wish to order to the shopping basket then proceed to the secured checkout. Seeds sent free of charge when ordered with plants. *Postage & packing charges are calculated based on an average parcel containing 6 plants. We accept payment by credit or debit card, Paypal, or bank transfer. Every order placed with Barnhaven must be paid at the time of ordering. Credit or debit card: we use the service E-Transactions/Paybox of the Crédit Agricole – a secure online payment gateway: no card numbers are stocked on our server. Payments will be made in Euros. For security reasons, customers are requested not to send credit or debit card details by email. Bank transfers: only within the European Union. Seeds: Each seed packet contains approximately 35 seeds except where otherwise stated. Please follow our sowing instructions carefully and keep your seeds refrigerated if not sowing directly. Plants: Our special plant packaging enables us to ensure that your plants arrive in excellent condition. 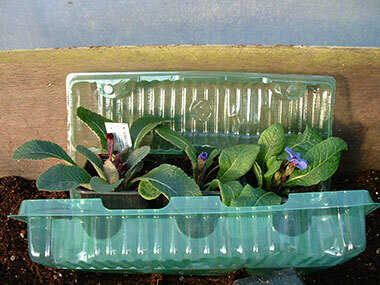 Each packet contains 3 plants in 7cm pots. These are mature plants ready to be planted into the ground or window boxes and containers. Please note that hellebore plants may sometimes be sent bare-rooted in order to keep postage costs down. All plants will be sent bare-rooted to countries requiring phytosanitary certificates. NB Plants travel well this way, but we cannot be held responsible for any delays caused by customs and/or postal services. If certain plants or seeds run out of stock after an order has been processed, we reserve the right to substitute similar plants or seeds in the absence of other instructions. If you don’t wish to receive substitutes, please indicate ‘no substitutes’ in the comment box. If you wish to suggest acceptable substitutes, please make a note of them when placing the order. If you would like to reserve seeds or plants that are out of stock at the moment on our website (i.e. for when the new crop becomes available in the autumn), please e-mail us at info@barnhaven.com, or make a note on your paper order form. We will contact you when the seeds or plants are available. Seeds are dispatched all year round, and an effort is made to send seed orders within 3 working days of their reception, by priority mail. Occasionally there can be longer delays at very busy times, or if the order needs a phytosanitary certificate according to the country of destination. If you have not received your order within 28 days, please contact us. Plants are dispatched from October to June, taking into account availability, state of culture and climatic conditions prevailing at the time. Orders placed in July, August and September will be dispatched from October onwards, when the plants are ready. Your order is carefully selected from the best plants available. To ensure they arrive in the best possible condition they will be checked for pests, cleaned and put under shelter for a few days to avoid excess humidity on the leaves during transit. Between October and June plants are dispatched on Mondays or Tuesdays in order to avoid weekend delays in transit. All plant orders received before 12:00 pm on the Thursday of each week will be dispatched at the beginning of the following week. We reserve the right to delay orders if the weather conditions are unfavourable (frost, excessive heat). In this case you will be informed by email. Plants are dispatched via the Post Office Colissimo service. Please contact us if you have not received your order within 14 days of dispatch (taking variable transport delays into account). These delivery times are a general guide only and we cannot be held responsible for delivery delays once the order has been given to the transporter. Please note our plants are pretty tough and usually recover well even after quite a while in transit. Please contact us if you have specific requests regarding the delivery date of your order, or make a note in the comment box when you place your order. When your order has been dispatched you will receive a confirmation email. If your order contains plants you will also have details for tracking your parcel which may be done via the site www.laposte.fr. We can deliver plants and seeds to any country within the European Union. However, restrictions apply to certain other countries. If you cannot find information about your country of residence, please contact us before ordering. (1) Seed orders to be delivered to the US: Instead of paying for a phytosanitary certificate it is possible to apply for a Small Lots of Seed Permit free of charge. It is valid for three years and may be used several times. It is easy to obtain from the Animal and Plant Health Inspection Service and you can apply online or by post. There is a very comprehensive description of how to obtain and use it on https://nargs.org/small-lots-seed. Once you have obtained your permit, send us a copy of the 3 pages of the permit and the mailing label. We will then reimburse the charge for the phytosanitary certificate before sending out your order. Any plant orders sent to the US must be sent bare-rooted accompanied by a phytosanitary certificate. For plant orders up to and including 13 plants. We can send this order directly to your home address. Your parcel may be stopped and checked by customs but we recommend this method as there are less delays and problems with customs. If you want to order more than 13 plants, we suggest you place several orders. Otherwise, you have to apply for a free import permit from the USDA authorities. It is not obligatory but large orders may be stopped if you do not have this extra document. If you apply for this certificate the plants will be sent directly to the Customs department which can cause unnecessary delays, and sometimes the plants are confiscated . Please note that we cannot be held responsible for any plants confiscated or delayed by customs, and we will not reimburse your order if this is the case. Send us a copy of the three pages of the permit and the mailing label by email (PDF files). (2) Plant orders to be delivered to Canada: once you have placed your order on our website, you need to apply for an import certificate from the Canadian authorities. When you have obtained your import certificate, please send us a copy of it by email. We can then apply for the phytosanitary certificate and dispatch your order. We advise customers to contact their local Agriculture Canada Office to enquire how quickly they dispatch plants when they arrive, as it does seem to vary according to the region. (3) Plant orders to be delivered to Norway: A few days after ordering on our website, you will receive an email with a copy of the phytosanitary certificate. Register this certificate with the Norwegian administration MATS (Mattilsynets skjematjeneste), via this website. There is a link for guidance (E-learningsguide). Otherwise you can contact the inspector in your region for help. We are extremely vigilant over the packaging of our products, but cannot control the delivery conditions of the orders from the time they are handed to the transporter. Therefore guarantees cannot be given either for transport delays or conditions in which they are transported. please check the parcel with the transporter if possible, and indicate any problems on the delivery note. If you are not entirely satisfied with the plants or seeds on arrival, contact us within 3 days. If possible send us a photo of the parcel, plants or seeds by email.